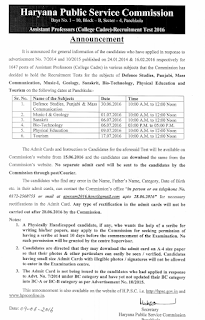 Haryana Public Service Commission (HPSC) is going to conduct written test for Assistant Professor (A.P.) posts. The written exam date had been announced. The test is scheduled to be held from 30 June to 17 July 2016. Earlier Haryana Public Service Commission had completed the process of getting applications for 1647 posts of Assistant Professor (College Cadre) against advt 10/2016. The Admit card of HPSC Assistant Professor (AP) had been released on 15 June 2016. Those candidates who had applied, can download HPSC Assistant Professor Exam Admit card from the direct link given below. Haryana Public Service Commission is going to conduct written exam from 30 June 2016 onwords for Assistant Professor posts. For that, admit card are available from 15.06.2016. Candidates can download HPSC Assistant Professor admit cards from the official website hpsc.gov.in via the direct link given below. The test will be held at various centres. All the important details like exam venue, roll number, date and time etc. had been mentioned in the hall ticket. Current Status: released on 15.06.2016. 4. Bio-Technology: 06.07.2016 03:00 P.M. to 05:00 P.M.
Botany, Biotech, Chemistry, Commerce, Computer Science, Def. Studies, Economics, Geography, English, Fine Arts, Geology, Home science, Hindi, History, Mass Comm, Math, Music (I), Music (V), Phylosophy, Physics, Phy. Edu., Pol Science, Psychology, Public Admin, Punjabi, Sanskrit, Sociology, Tourism, Zoology. The written examination consists of multiple choice objective type Questions. The candidates can download their admit card from HPSC website from here. The admit card should be printed on a paper and bring at the time of test. Selected candidates will be given Pay Scale Rs.15600-39100+Rs.6000/- G.P. with new pension scheme. In order to download the admit card for HPSC Assistant Professor exam, candidates need to visit the direct link provided here (after release). It will take you directly to download page. Then candidates need to enter their registration details and click submit. 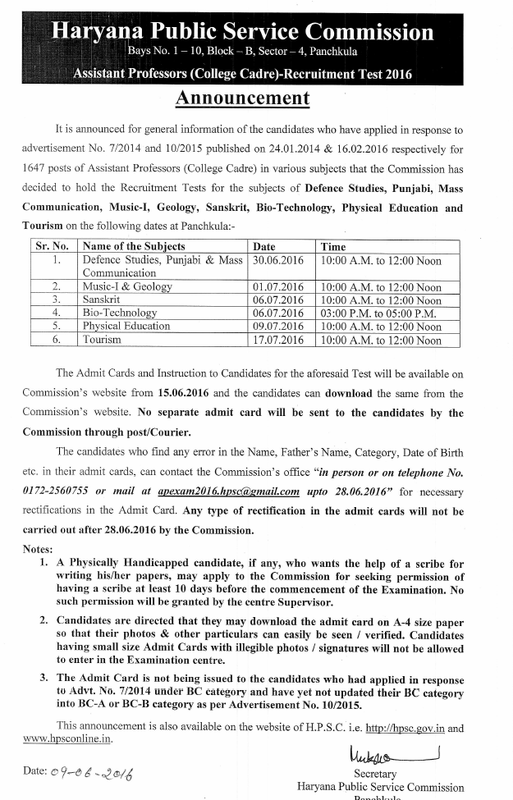 Their HPSC Admit card 2016 will be shown to them and candidates should take a printout of it.